LOCATION.--Lat 39°09'28", long 74°41'52" referenced to North American Datum of 1983, Sea Isle City, Cape May County, NJ, Hydrologic Unit 02040302, on bulkhead at Sea Isle City Municipal Marina in Sea Isle City, 700 ft southeast of east side of bridge on John F. Kennedy Boulevard (County Route 625) over Ludlam Thorofare, and 0.9 mi south of Ludlam Bay. PERIOD OF RECORD.--Continuous-record tide gage, May 1975 to May 1978, February 2000 to current year. Annual maximum tide, October 1978 to September 1984. Unpublished fragmentary gage-height record, May 1997 to January 2000. GAGE.--Tide elevation and water temperature recorder with telemetry and tidal crest-stage gage. Datum of gage is at 0.00 ft NAVD of 1988. 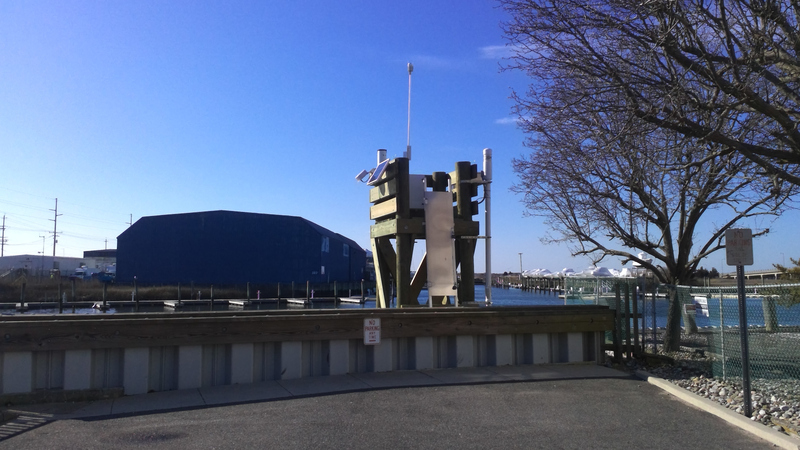 To determine approximate elevations to NGVD of 1929, add 1.27 ft. From May 1975 to May 1978, the tide elevation and water temperature recorder was located at 44th Street, 800 ft southwest of current station and datum of gage at 0.00 ft NGVD of 1929. From October 1978 to September 1984, tidal crest-stage gage located at 44th Street, 800 ft southwest of current station and datum of gage at 0.00 ft NGVD of 1929. Data published to NGVD of 1929 can be adjusted to NAVD of 1988 by subtracting 1.27 ft. Online peaks have been adjusted to present datum. REMARKS.--Gage cannot measure tide elevation below -3.00 ft. Tide elevations below -3.00 have been estimated. From Jul 25, 2005 to Jun 2, 2009, gage could not measure tide elevation below -2.8 ft; from Aug 13, 2003 to Jul 25, 2005, gage could not measure tide elevation below -1.50 ft; prior to Aug 13, 2003, gage could not measure tide elevation below 2.85 ft. Periods of missing data are noted by dashed (---) lines. EXTREMES OUTSIDE PERIOD OF RECORD.--Maximum elevation known, 6.14 ft, adjusted to present datum, Dec 11, 1992, from high-water marks at northwest end of Third Street just south of Sea Isle City Boulevard leading into Sea Isle City.